If you’ve been travelling in South East Asia you know there is quite a huge risk that you will get hit by a motorbike. And it’s not because some of us are not used to look to the left instead the right before we cross the streets. It’s because they are everywhere! Side note fact: there are about 4.2 million people living in Bali and there are more than 1.9 million motorbikes registered. One of the big advantages of the Gili Islands is that there is no traffic at all. So no cars, no bikes, no worries. The closest thing you will find that falls into the transport category is a horse cart, or as the local community will say a Cidomo. To discover the island you can either rent a bicycle or, as everything is close by, just take it easy and walk. With more than 17.000 islands spread across 5,000 kilometres of tropical ocean Indonesia is the perfect place to work on your bucket list. And with visiting the three Gili Islands there are only 16.997 islands left to discover. Indonesia is the home of over 200 million people and more than 300 distinct ethnic groups have found and made their homes here, speaking hundreds of different languages and dialects. The first inhabitants of the Gili islands were fisherman from Sulawesi. 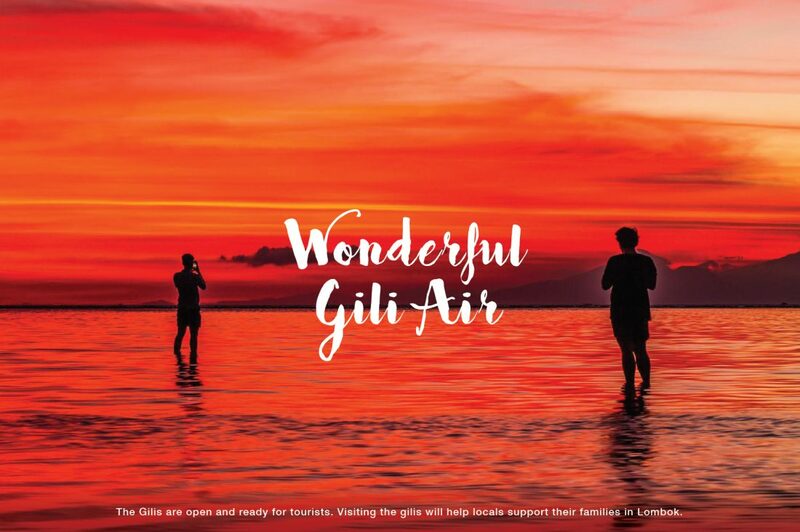 Gili Air literally means Small Island of Water. And that’s exactly what a few people discovered more than 200 years ago when they were pushed by a storm to the Gili Islands on their way to Java: Gili Air has drinking water and is great place for fishing! At that time, marking out a field with a simple fence was enough to claim of a piece of land. The first traditional houses were build and over the years this new community blended their different dialects into the Sasak language which nowadays is the local language on the Gili Islands. So if you’re sitting in your office right now day dreaming of hopping from one tropical paradise to the next one, don’t hesitate any longer. We can’t wait to meet you and show you around! Every sunset brings the promise of a new sunrise. And every sunset is magical and different. But to describe the sunsets on Gili Air we need another word. A word that can explain why so many people that life on the Gili Air will say that it’s their favorite time of the day. A word that can describe the feeling that the whole world is slowing down and you can let everything go. A word that can describe the moment where you sit down on the beach and you look at the sky and everything feels like it isn’t really real. This moment were you forget everything around you because for now it’s just you, the world and this mind blowing sunset. 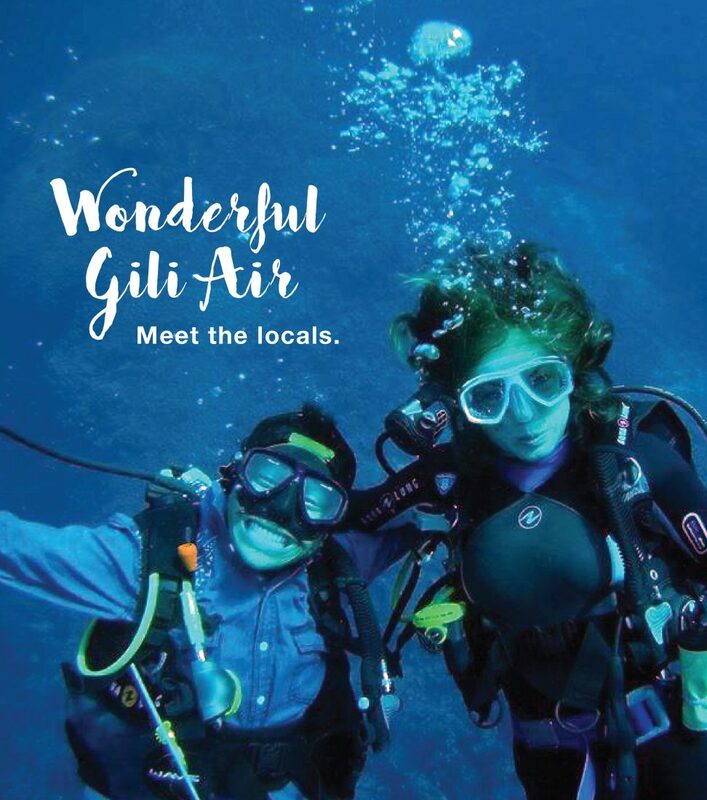 One the many things that the Gili Islands are famous for, is that they are surrounded by a magical underwater world. Indonesia is the home of 20% of the world’s coral reefs. Divers from all over the world come to immerge themselves into the warm and clear waters and the amazing diversity of marine life. With more than 25 dive sites around the Gili islands there is so much out there to discover: small little funky looking creatures like ghost pipe fish, mantis shrimp, pygmy seahorse, blue ringed octopus, frogfish and a wide variety of nudibranches. And some big stuff that will blow your mind like, white and black tip sharks, blue spotted stingrays, eagle rays, manta rays, schools of bumbhead parrotfish and sometimes even a whale shark pops by to say hello. Not to mention the great amount of turtles. Some even call it the turtle capital of the world! 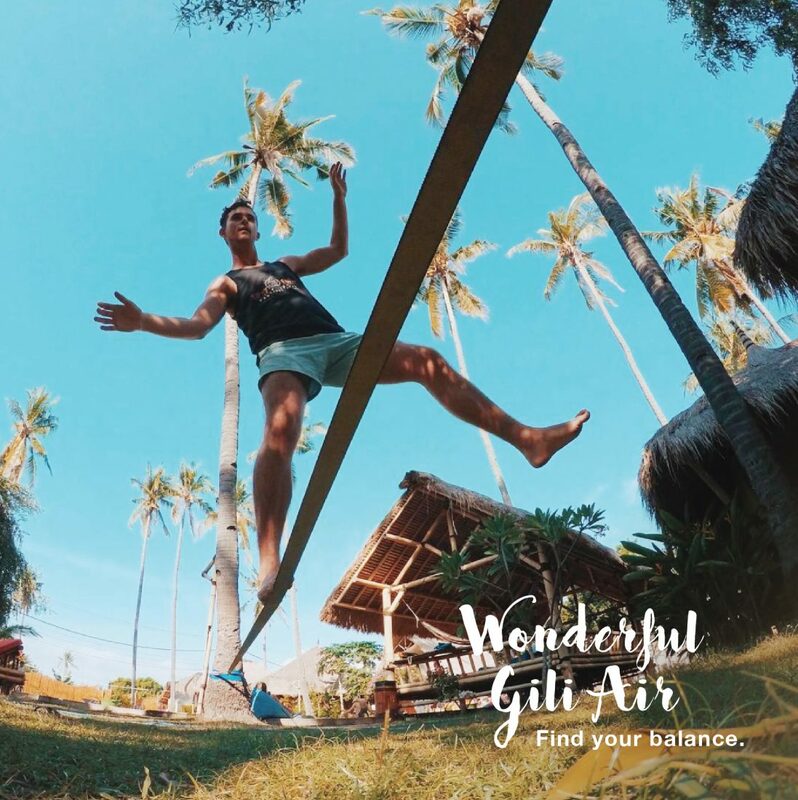 Gili Air is the perfect destination for everyone: backpackers, tourists, yogis, hippies, hipsters, families, sun worshippers, action seekers, the rich & famous, everyone can find what they are looking for. Are you one of this few people that doesn’t know how to get rid of your money? 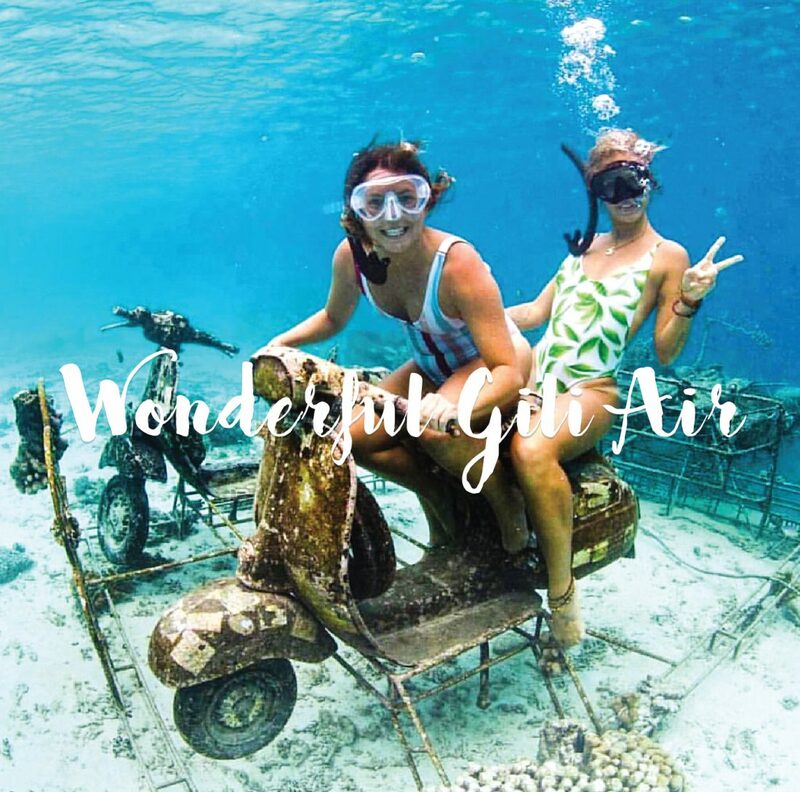 No worries, just fly to the Gili Islands with a helicopter, book yourself a private villa with a minimum of 10 staff and eat as much lobster as you can in one of the fine dining restaurants. Are you traveling on a budget? Walk in to one of the many homestays, have dinner with your new backpacker friends on the night market and find yourself at the end of the night sitting around a bonfire on the beach watching the falling stars. There is only one thing that you need to leave at home and that’s your dog. The Gili Islands are Muslims as there Sulawesi ancestors were Muslim and for this reason there are no dogs allowed on the islands. You can literally eat for days in Indonesia and always be trying something new. Try Rendang Curry (chicken or beef), Sate (barbeque chicken, lamb or beef with peanuts sauce), Bakso (beef or fish meatball served like soup with noodles and vegetables), Gulai (boiled meat or fish with coconut milk dressing), Pepes (steam tofu, meat or fish combine with vegetables wrapped in banana’s leaf), Gado-Gado (mixed vegetables light boiled served with peanuts sauce). One of our favourite desserts would be Indonesian sweet Martabak. An Indonesian version of a thin pancake. Customize your Martabak with a filling of chocolate, bananas, cheese or peanuts. 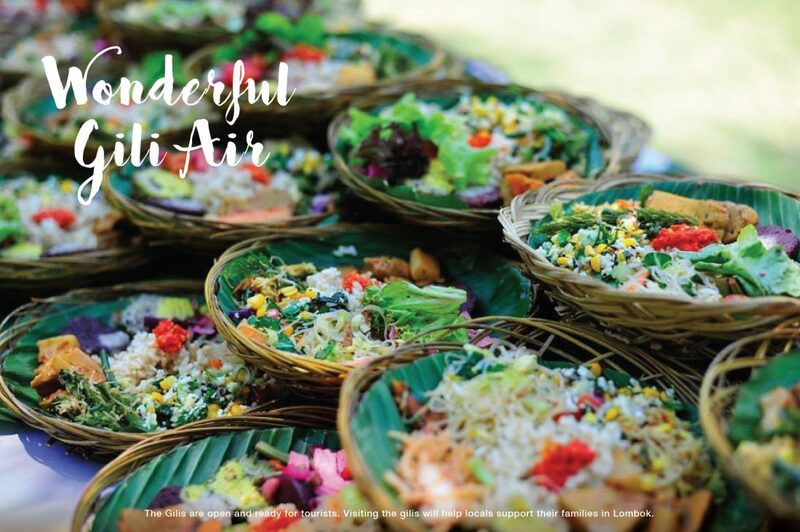 Gili Air is are a great place for foodporn lovers. From sweet to very spicy, but always fragrant, full of flavour and always a teaspoon of love. A wealth of choice in fish, meat, vegetables – and not forgetting the vegetarian Tahu (tofu) and Tempeh. You can get almost any local dish for under $2,5 dollar, so make sure you try as much as you can while you’re here! They say that people make the place and this is definitely true when it comes to this special island. 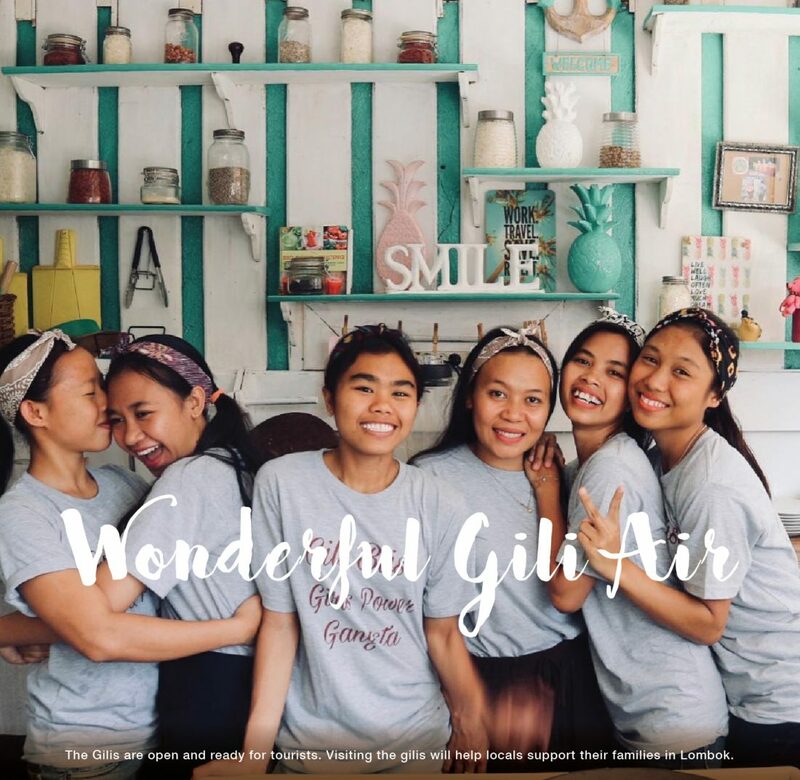 Gili Air attracts people from different walks of life and from every corner of the globe. Here you will find a unique mix of expats, locals and tourist living together in harmony and you will meet some of the biggest smiles you have ever seen. All these people together create a magical vibe which makes you forget everything around you. You wouldn’t be the first person that has the intention to stay for only two of three days and ends up staying for months or years. With all the activities and possibilities on the island we promise you: it never gets boring. Book a snorkeling trip, try Subwing, get your diving license, go surfing or kite surfing, rent a kayak, go horse riding on the beach, try the SUP boards, book a yoga retreat or attend a cooking class.